Even regular auto transport can seem stressful. Our vehicles are an essential part of our routine and allow us to easily get around. Not to mention, your car is your personal property that you have also invested money in. That is why it is not always easy to rely on a car transporter with moving your vehicle. You want to be sure your car will be safe. That is, even more, the case if you need an exotic car. Such a vehicle can be something to be proud of or a gem in your collection. When you need to ship it, you want to get the highest quality exotic car shipping. And that is what we can provide! At Baltimore Car Transport we know how to take care of your precious exotic vehicle. We have a lot of experience shipping sports cars, rare classic cars, retro cars, and other exotic vehicles. Our professional team will organize safe and secure door-to-door car shipping for you. All of our drivers are highly trained and have years of experience in Baltimore auto transport. With our company, you will not have to worry about the safety of your vehicle. Plus, your car will be covered by our car carrier’s insurance for the time of transit. 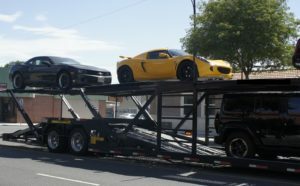 With our exotic car transport, we provide enclosed auto shipping. This means that we will ship your car in an enclosed trailer, which ensures the best protection for the vehicle. If your car is shipped in an enclosed trailer, it is protected from weather, dust, dirt, and debris. While exotic car shipping is a premium service, we have some of the lowest rates! Get a free quote for shipping your car today. Baltimore Car Transport is looking forward to assisting you!